Which is the Best Red Reishi Mushroom Extract For You? 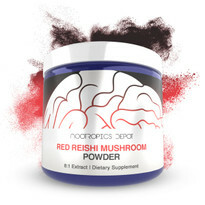 Nootropics Depot offers both a 1:1 and 8:1 extract of Red Reishi mushroom. We are often asked which Red Reishi extract is best. Our previous blog discussed our 1:1 and 10:1 Cordyceps extract, and our Reishi is similar, but not the same. Let's take a look at the differences between these two high quality mushroom extracts, and help you decide which Red Reishi is right for you. Before we discuss the differences between the extracts, we would like to discuss sourcing. Our Red Reishi extracts start their journey deep in the Mountains of China on the farms of Nammex Organic Mushrooms. The mushrooms are grown according to certified organic practices and in environments with very little pollution. This leads to mushroom extracts that are very low in heavy metals and very high in the bio-active compounds, since we use the whole fruiting bodies. As you may have read elsewhere, some competitors have actively lobbied against using mushroom products from China, with the claim that their air pollution causes very high levels of heavy metals to accumulate in the mushroom fruiting bodies. Similarly, there have also been concerns over Chinese quality control when it comes to mushroom extracts; which, as some allege, is allowing many heavy metal-laden products to enter the United States. We find that these statements are being made not from a place of concern or scientific merit, but to try and discredit whole fruiting body mushroom extracts, and dissuade people from trusting them. Why would someone do this? Well, if you are a vendor in the United States selling low-quality mycelium on grain products, and word starts getting out about how these products don't contain the proper active ingredients they should, and are full of a bunch of rice/starch filler to pad the polysaccharide numbers, what is your only real defense? To obfuscate and try to seed doubt in the alternatives. The science is pretty clear, and the word is starting to get out. Mycelium on grain products are not mushrooms, and do not contain the same actives as real whole fruiting bodies do. It's very hard to defend against that, and try to convince people that real mushrooms are worse than ground up myceliated rice. So rather than admit they are selling low-quality products, and make a change, they spread fear. "It's China, so they must have tons of pesticides and heavy metals." Not only is that a poor argument easily seen through, it's easy to prove wrong with testing. That being said, there is some truth hidden in the propaganda. There are low quality suppliers for pretty much anything. However, it reinforces the point that we at Nootropics Depot have stressed from the very beginning; which is that all mushroom extract vendors have a responsibility to test their products when they are imported into the United States. More importantly, they must reject batches that contain dangerous levels of contaminants, or too low of active ingredients. Proper testing and quality control is a must, whether a product comes from China, India, the US, or Europe. Not only does Nammex test the mushroom extracts here in the US, but we at Nootropics Depot do as well. We check and double check our products, and we are not afraid to reject a batch if something doesn't seem perfectly correct. You may even notice us go out of stock on certain things for a few weeks. This recently happened with our cordyceps. The cordycepin content did not meet our spec, so we rejected the batch till we could get one that met our standards. We would rather go out of stock than sell a product that does not meet our standards. This is what is needed in the supplement space, but is sadly lacking. GMP guidelines say you can do skip-lot testing, and only test some of the batches coming in. We say that's not good enough. Every batch gets tested, period. So, can products from China contain heavy metals or too low of active ingredients? Sure, just as they can from anywhere. However, when you use a company that cares about quality, and are going above and beyond GMP testing practices, you don't have to worry. Testing and quality control are what protects you as consumers. Taking that into consideration, the argument some of our competitors have made only solidifies our position; and it certainly doesn't make myceliated rice a good alternative. You can always rest assured that mushrooms you buy from Nootropics Depot will be safe and have the appropriate level of active ingredients. Our partnership with Nammex Organic Mushrooms gives us complete oversight on the mushroom products we offer. Nammex has a pristine, unpolluted mountain location (found more than 20 years ago) which gives them the ability to grow safe and highly efficacious mushroom extracts at an affordable cost. The Red Reishi mushroom, also known as Ganoderma lucidum, is grown on wood substrate logs which is necessary for the formation of the highly beneficial triterpenoids present in our Red Reishi extracts. Any Red Reishi product that is not grown on a wood-based substrate will not contain appreciable levels of triterpenoids. After harvesting the Red Reishi fruiting bodies, they go through a rigorous quality control process and are then further processed at a nearby facility. For the 1:1 extract, the Red Reishi is mixed with hot water. This helps break down the Chitin in the fruiting bodies which leads to better bioavailability and digestibility of the mushroom. None of the starting material is discarded, which makes the 1:1 Red Reishi a full spectrum extract that will provide all of the beneficial compounds present in the Ganoderma lucidum mushroom. Think of all of our 1:1 "extracts" as whole powdered mushroom, just with the chitin broken down to be more bioavailable. Since you don't lose any material, the beta-glucan content is very high. By comparison, another extract that is made at this facility is a highly-potent ethanol extracted 16:1 Red Reishi mushroom extract. This Reishi extract requires a whopping 16 pounds of raw Red Reishi to make just one pound of the finished 16:1 Red Reishi extract! The triterpenoids in Red Reishi are readily soluble in ethanol, whereas the beta-glucans are not. By using ethanol as the extraction solvent, we end up with a highly-potent triterpenoid extract. The 16:1 Reishi extract has some of the highest triterpenoid levels we've ever seen. However, since beta-glucans are not as soluble in ethanol, you see a lot lower levels. So how do we get the best of both worlds? We mix the 16:1 with the 1:1 Reishi extract in order to add Beta-Glucans back into it, resulting in our 8:1 extract. This gives you not only high levels of beta-glucans, but high levels of triterpenoids. Once the extract is ready to be shipped to North America, it is tested in China at the manufacturing facility. This analytical testing is then reconfirmed by independent analytical labs in the United States after which it is sent to us. Once it reaches us, Nootropics Depot tests it yet again for heavy metals and efficacy. 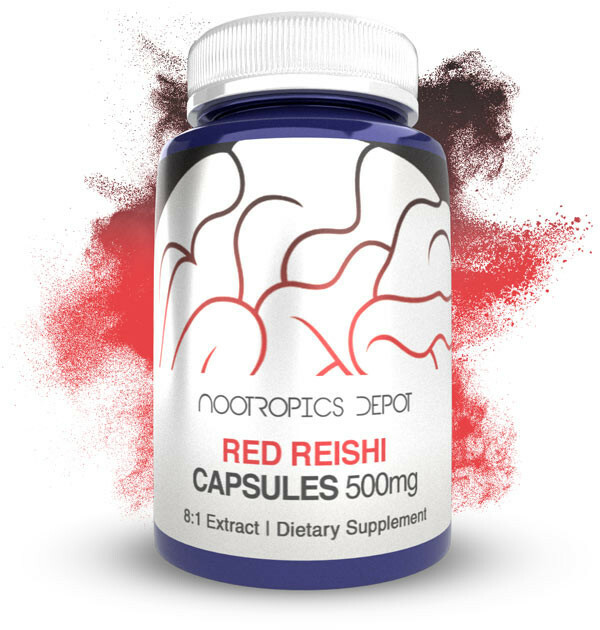 This process results in two Red Reishi extracts from Nootropics Depot that are very efficacious and very low in heavy metal content. You may have noticed that this new 8:1 extract replaced our old 4:1 extract. However, we were able to keep the price the same. So you are now getting a much more potent extract for the same price! Now that we know exactly where Nootropics Depot's Red Reishi mushrooms come from, how they are extracted, and how stringent our testing protocol is, we can compare the effects and health benefits of Red Reishi mushroom and why you may want to to choose one mushroom extract over the other. The main differences in effects between the 1:1 and the 8:1 are that the triterpenoids may have more prominent immune-modulating and brain health-promoting effects. This means that the 8:1 extract will have more prominent effects in this area. Anecdotally, the 8:1 extract also seems to be a little bit calming whereas the 1:1 does not seem to have as potent of calming effects. If you are just seeking general inflammation mitigation and immune-boosting effects, then we would recommend considering the 1:1 extract, as it is very effective for these purposes. However, if you are after a more noticeable effect in terms of cognitive function, whilst still enjoying the general health benefits that the Ganoderma lucidum mushroom may provide, then the 8:1 extract would likely be the best option for you. Nootropics Depot offers our 1:1 Red Reishi extracts in powder or capsule form and our 8:1 Red Reishi extract in powder form.